Order now 17mm mini sclera ColourVue Tigera contacts! They will make you look like a big cat thanks to their brilliant combination of yellow and black on a large diameter lens. Turn into a deadly tiger with ColourVue mini sclera Tigera contact lenses! 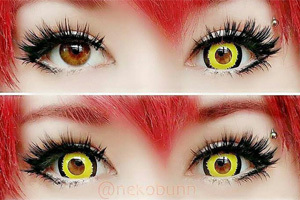 Due to their enlarged diameter, these contacts create a very convincing yellow eyes effect. The black outer edge of the lens emphasizes the brightness of the yellow inside, creating a striking effect on the eyes. Because these contacts are not scleral, they do not require a special container and can be stored in a regular sized one, with a disinfecting solution. They are also much cheaper than scleral lenses as their manufacturing process is similar to the production of regular contact lenses.